On May 10, 2004 we had our first meeting. We had a Hibiscus fiber workshop, where we learned to process and make cordage from fiber that had been collected earlier that week. We all had fun and will use the cordage in a later project. That's Cassandra Jones, Secretary, at left, walking to her car after the meeting. 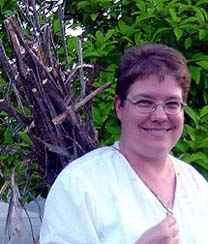 Cassandra is carrying a load of hibiscus stalks which she will later process into fiber. They are bound with the cord she twisted at our first meeting. She looks pretty proud of herself, doesn't she? Good work, Cassandra! In late May we started processing some large rescued yuccas. They can be used for coiling or twining. It will take some time to process it all. At nearly $20 for 2 ounces, when you can find it, it pays to process it yourself. 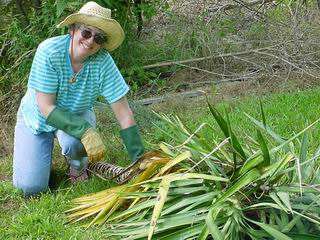 Pictured below is Pamela Zimmerman with one of her yuccas. Create random weave garden baskets using collected twigs and vines. Learn to coil pine needles on a gourd.